Soothes delicate skin around the eyes. 96% NATURAL - suitable for all skin types. Daily 2-in-1 cleansing balm infused with jojoba beads to gently exfoliate while you cleanse. 98% NATURAL - suitable for all skin types. A deep penetrating balanced cleansing balm enriched with jojoba beads that release intensely nourishing esters to gently exfoliate. Our beads are 100% natural, solidified jojoba that is completely safe and eco friendly. Vitamin C rich quandong, aloe vera and vitamin E deeply cleanse without stripping skin of its natural oils. Jojoba's natural cleansing and moisturising properties leave the skin clean, soft and luxuriously hydrated. Apply gently over the face to cleanse in a circular motion. 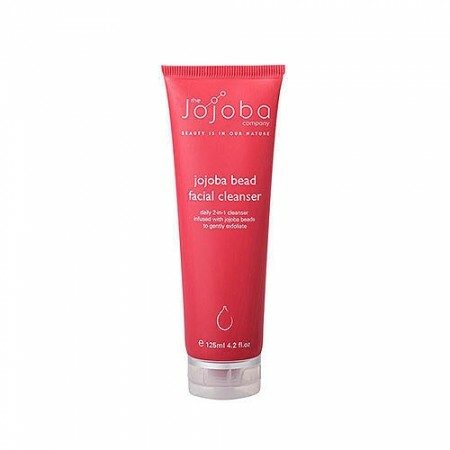 You will notice the beads will gently exfoliate and dissolve to add more moisture to the skin. Can be used daily as a 2-in-1 cleanser and exfoliator. Follow with a cream from The Jojoba Company. Aqua (Water), Cetearyl Alcohol, Simmondsia Chinensis (Jojoba) Seed Oil*, Glycerin, Jojoba Esters, Stearic Acid, Ceteareth-20, Butyrospermum Parkii (Shea) Butter, Prunus Amygdalus Dulcis (Sweet Almond) Oil, Macadamia Integrifolia (Macadamia) Seed Oil, Helianthus Annuus (Sunflower) Seed Oil, Cocos Nucifera (Coconut) Oil, Aloe Barbadensis (Aloe Vera) Leaf Powder, Tocopherol (Vitamin E), Hamamelis Virginiana (Witch Hazel) Extract, Saponaria Officinalis (Soapwort) Leaf Extract, Santalum Acuminatum (Quandong) Fruit Extract, Carica Papaya (Papaya) Fruit Extract, Cucumis Melo (Melon) Fruit Extract, Cananga Odorata (Ylang Ylang) Flower Oil, Cedrus Atlantica (Cedarwood) Bark Oil, Rosa Damascena (Rose Maroc) Flower Oil, Xanthan Gum, Caprylhydroxamic Acid, Caprylyl Glycol, Phenoxyethanol**, Potassium Sorbate**, Citric Acid, Sodium Benzoate, Alcohol, Benzyl Benzoate^, Benzyl Salicylate^, Citronellol^, Geraniol^, Linalool^. ^From natural essential oils. *100% Natural Australian Jojoba **Preservatives.